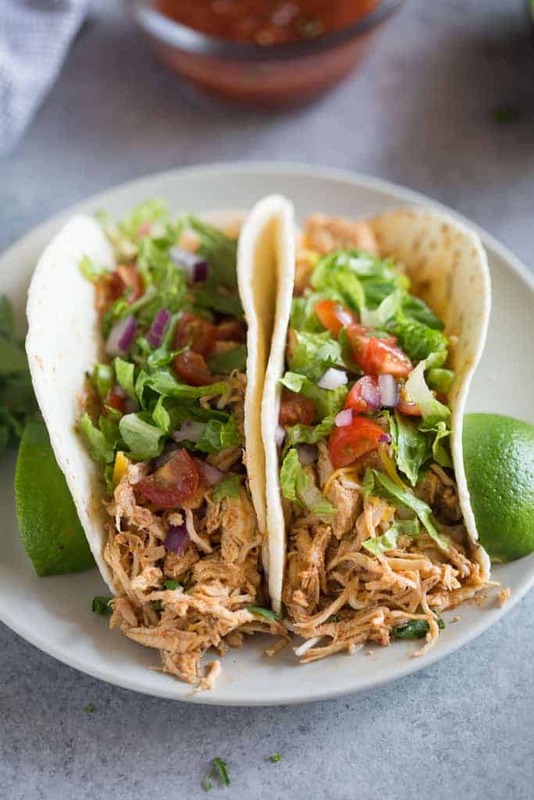 This Slow Cooker Chicken Tacos recipe makes delicious chicken that can be used in tacos, burritos, tostadas, enchiladas, and more. I’ve also included instructions for making these chicken tacos in the instant pot. This is a healthy and easy recipe that is perfect for busy families who love their crockpot or instant pot. I wouldn’t dare to dream of a world without slow cookers. I love mine so much! It just makes life easier ya know? Prep dinner in the morning and it’s ready when you need it. Late afternoon is the craziest time of day in our house, and I’m sure most people can relate, so there’s nothing I love more than having dinner ready to go! Especially when I’ve got hungry kids waiting on me. This slow cooker chicken tacos recipe is the best because you can use it in so many different meals. 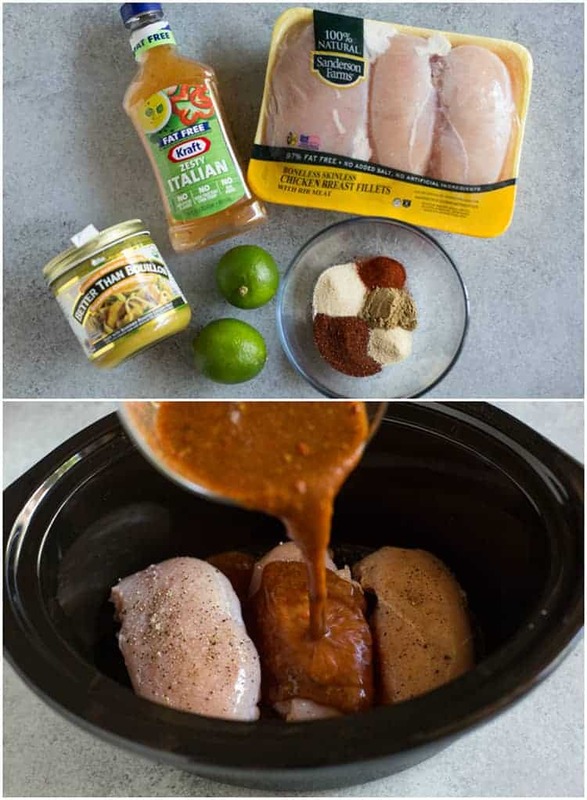 Pretty much any Mexican related recipe you love, you could add this chicken too (or substitute the meat called for in the recipe and use this chicken instead). Use it in these chicken chimichangas, black bean and corn quesadillas, taco salad, or any of your favorite burritos, tostadas, or enchiladas. Gather your ingredients including chicken breasts, chicken broth, Italian dressing, lime juice and spices. Place your chicken breasts in the slow cooker. Mix the remaining ingredients together in a bowls and pour the mixture over the chicken breasts. Cook on low for 4-5 hours. Shred the chicken and cook for an additional 30 minutes to allow it to absorb some of the sauce and juices. Place your cooked chicken in a corn or flour tortilla and add your favorite toppings, like shredded lettuce, cheese, tomato and onion. Can chicken tacos be healthy? These slow cooker chicken tacos are a healthy recipe that your whole family will enjoy. Chicken is a lean meat that provides protein and I love to add lettuce or spinach along with tomatoes, avocado and cheese. You can serve them with a whole wheat tortilla for some added fiber. 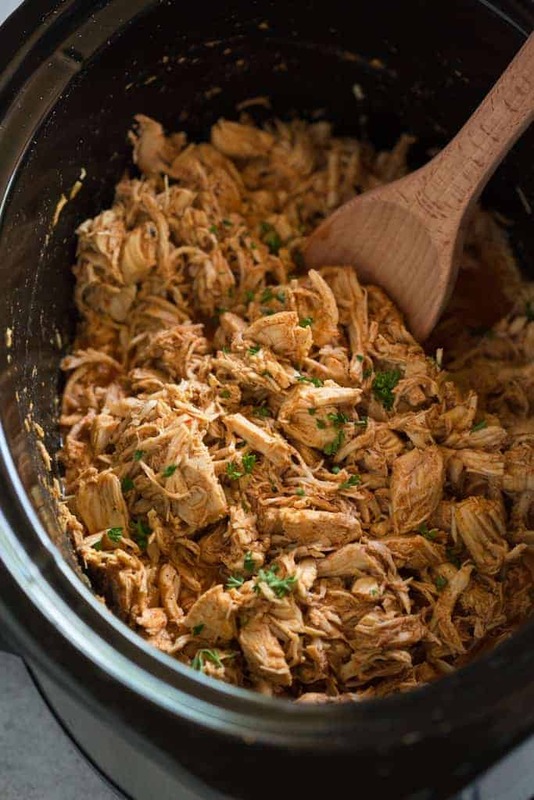 This recipe can be easily adapted to make shredded chicken for tacos, in the instant pot! If using the instant pot I like to use 1 cup of salsa instead of chicken broth and Italian dressing because I think the flavor holds up better under pressure. BUT, either will work! Season the chicken with the spices and place the breasts in the bottom of the instant pot. Cover with salsa (or broth and Italian dressing) and lime juice. Cook on Manual (High Pressure) for 8 minutes. Quick release the pressure and carefully remove the lid. Shred chicken, and serve in tortillas, with desired toppings. 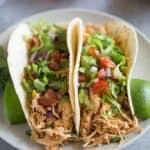 This Slow Cooker Chicken Tacos recipe makes delicious chicken that can be used in tacos, burritos, tostadas, enchiladas, and more. Instructions for the Instant pot included! In a small bowl whisk together the remaining ingredients and pour them over the chicken in the slow cooker. Cover and cook on HIGH for 2 1/2 hours or LOW for about 5 hours. Shred the chicken. Cook for 30 more minutes. Serve chicken with tacos, enchiladas, quesadillas, tostadas, burritos, taco salads etc. I like to use 1 cup of salsa instead of chicken broth and Italian dressing for the instant pot because I think the flavor holds up better under pressure. But either way will work! Season the chicken with spices and place in the bottom of the instant pot. Cover with lime juice and salsa (or broth and Italian dressing). Cook on Manual (High Pressure) for 8 minutes. Quick release the pressure and carefully remove the lid. Shred chicken, and serve in tortillas, with desired toppings. *I originally shared this recipe July 2015. Updated July 2018. I’m making this now, cooking in crock pot for five hours. I just shredded it to cook another 30 mins but seems to have a lot of liquid in it, do you drain before you use for tacos? Sire smells wonderful ? And day two perks: the recipe is very “brothy” as others have commented but to serve as tacos I just let the juice drip and served chicken in bowl for taco fixings. But today I ate the leftover chicken with the broth and added brown rice and avocado for a variation of chicken tortilla soup! Loved it. So tasty. I would add more lime juice, because I love that flavor. This is so yummy. Use it for all my Mexican dishes. Salsa no Italian dressing. I also use my mixer to shred the chicken. Much easier.